Description: NS 2669 was the middle unit on this eastbound mixed freight. Description: A second look at both the 2627 & 2669. Description: The Triple Crown train waits at East Grand Ave. for the signal to proceed over the Merchants Bridge to Madison, IL. I had always wondered how these trailers rode on the rails without the benefit of flatcars; now I know! Description: Eastbound on track two with a pair of EMD widcabs. 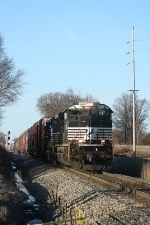 Description: NS 18K crosses the NS Chicago District diamond at CP-33 on the Marion Branch. Description: NS Eastbound Freight Train 334 ( Sheffield, Al. to Macon, Ga. ) stopped awaiting a signal to proceed at 2nd Avenue in Birmingham, Al. 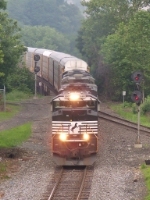 Description: A KCS unit is second in the consist of 212 as it heads through CP-Phillipsburg at 7:46AM. Description: OLS!!!! The first Operation Lifesaver -9 leads an M2 and a blue warrior on 21M westbound.